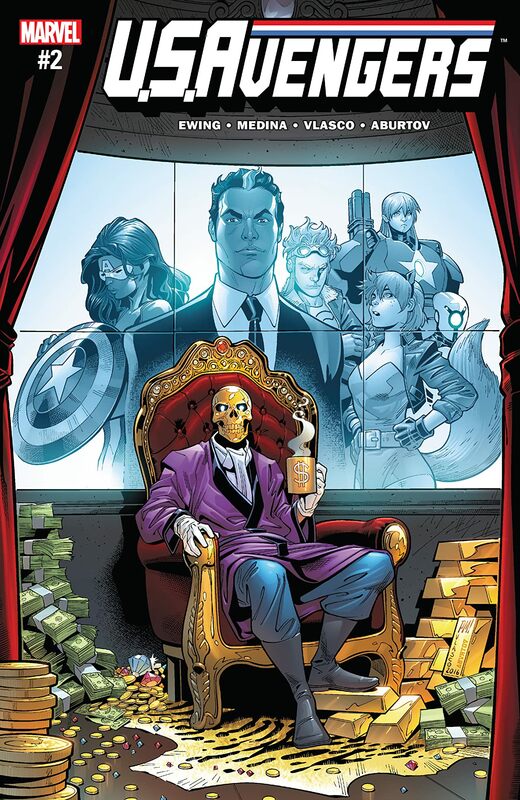 U.S.Avengers #2 Review: Yarr, Beware The Golden Skull, Matey! U.S.Avengers #2 has already gotten past the minor rough patch in the first issue. This one has more of an explanation for why the Captain American of 20XX and the Golden Skull are in town and it's amazing. I'm a huge fan of alternate universe-type stories where all of the normal Marvel characters have unique twists to them, like, say, the Hulk being in the Nova Corps or Spider-Ham. Granted, I don't know if the first example ever happened, but it would be cool if it did. Anyway, my point is that we get to experience all of the coolness of seeing those kinds of characters, but they're interacting with the normal Earth-616 characters. It's precisely why Secret Wars had some of the best tie-ins that I've ever read. In this case, we have the daughter of Jessica Jones and Luke Cage as Captain America and the Golden Skull just happens to be some kind of pirate. Yes, an actual pirate. He doesn't have a parrot, but I wouldn't be surprised if one popped up somewhere in the future. As Captain America explains, part of his reign came about after Zero Day, Thanos's massacre of almost all of the superheroes on Earth. In the wake of rebuilding the world, the Golden Skull started his campaign of looting and greed. Danielle, being a Captain America, is naturally his arch-nemesis. The gun was actually going to shoot out a bouquet for Jack's reward, but Captain America ruined it. Darn you, you patriotic pest! The comic only gets better from there, with a classic 'infiltrate the casino dressed in fancy clothes' spy scenario. The owner of the casino happens to be Brice Wyne, who I completely sure doesn't go around dressed up as some kind of winged creature of the night when no one's looking. It's this sense of fun and whimsy that makes Al Ewing one of the best comic writers out there. He knows how to inject the perfect amount of jokes into a story. I don't know what will happen next in "$kullocracy", but I'm sure that it will be wonderful. U.S.Avengers #2 is written by Al Ewing, drawn by Paco Medina, inked by Juan Vlaco, colored by Jesus Aburtov, and lettered by VC's Joe Caramagna. You can find it at your local comic book shop.